A private concert performance and supper that promises to be a very memorable evening of Russian music, painting, and good food, to raise funds for our Rosefield Mills project. Drinks will be served on arrival in The Yellow Door Gallery. A concert will then be performed in the warehouse space over the gallery, followed by a festive Russian Easter supper with the performers. The concert will include ‘Recovered Voices’, Peter Cowdrey’s Russian song cycle composed in 2016, performed by Catherine Woodward, a distinguished young British dramatic soprano, accompanied on the piano by the composer; and a virtuoso performance of Mussorgsky’s ‘Pictures at an Exhibition’, performed by Peter Cowdrey – with a fun twist: Mussorgsky described his pieces as illustrations; Russian artist Eugenie Vronskaya will reverse the creative process and create paintings on canvas while Peter Cowdrey plays Mussorgsky’s original score on the piano. The audience will find themselves surrounded by the ‘Pictures at an Exhibition’! 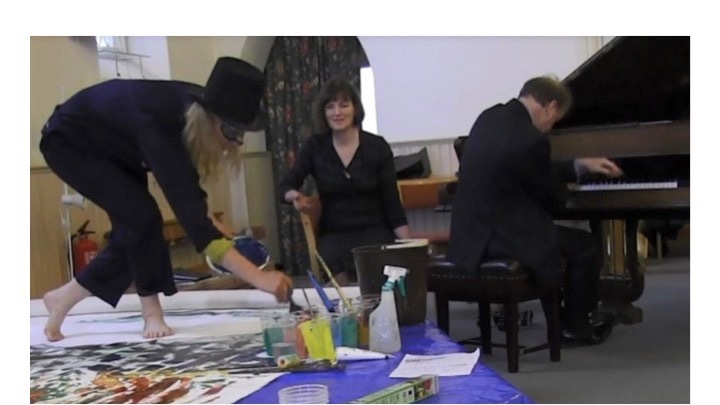 Eugenie’s paintings will be auctioned after the performance.